Hannah’s Bretzel is a sandwich shop truly deserving of its epithet, “Über.” And it’s not just the way the fresh, local ingredients are combined with the sustainably-sourced specialty ingredients to create wonderful sandwiches. 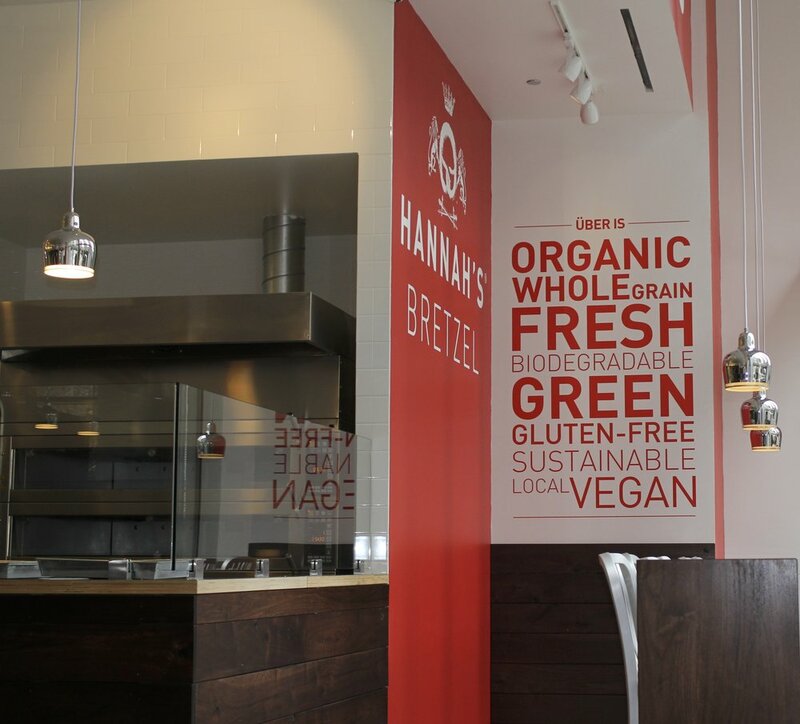 Hannah’s Bretzel’s commitment to sustainability and the environment goes above and beyond food to include renewable energy, biodegradable packaging, and even travelling around the city via bikes. Florian Pfahler, owner and founder of Hannah’s Bretzel, was one of the original supporters of Next Bites back when we were the Green Chicago Restaurant Coalition. His vision of a zero-waste restaurant was influenced by his childhood in Germany and his time spent visiting as an adult. His mother lives in a farmhouse near Munich, and in Bavaria composting and recycling are practiced by every household. When he visits, he drives by solar fields while travelling from the airport. Seeing these aspects of sustainability as a part of regular life in Germany is a reminder that the difficulties he encounters shaping his restaurants in the United States are surmountable. Florian is currently working to incorporate composting into his restaurants. One of the barriers he encounters is that composting, unlike sustainable food sourcing, is a more difficult sell to consumers when it influences food price. A consumer might be willing to spend $0.50 more on a sandwich for local tomatoes, but the same willingness does not extend to composting. As it stands, Florian is running a test-trial on composting at one of the locations to see if Hannah’s Bretzel will be able to handle the extra expense. If successful, composting will become a part of all Hannah’s Bretzel locations. Hannah’s Bretzel balances the local food and flavors on their menu with specialty food items that are sourced from around the world. From Florian’s perspective, the process of sourcing specialty ingredients such as Bresaola, an Italian cured beef, mirrors that for local produce. Getting local tomatoes from MightyVine necessitated talking with many specialty food distributors before creating the connections to get the tomatoes – the same steps it took to become the first business after Eataly to share Bresaola with Chicago consumers. Florian wants Hannah’s Bretzel to be about sharing flavors and ingredients with customers they may not otherwise try, and the sandwiches and chocolate selection achieve that with their balance of local and global flavors. Florian has brought to life a beautiful vision, one that shows us the best sides of globalization and locally-focused eating. The sustainability commitment embodied in the structure and running of his restaurants raises the bar for what we can expect restaurants to achieve while remaining profitable. Hannah’s Bretzel is a shining example of how a restaurant can incorporate sustainability and far-away flavors in one delicious concept.